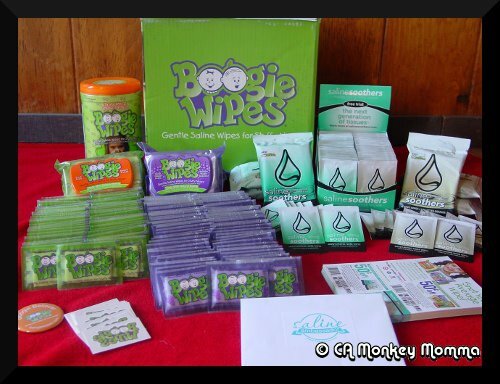 I am so excited to have been chosen as a Saline Ambassador for Boogie Wipes and Saline Soothers. My family has been using Boogie Wipes for what seems like years and I love them. I can never have enough Boogie Wipes when cold and allergy seasons hit. My four year old even likes to sleep with his own package of Boogie Wipes when he has a cold. I also send them to daycare with both of my boys. Their teachers love them and even buy Boogie Wipes for the classrooms on their own. As a Saline Ambassador I am lucky enough to get a kit filled with Boogie Wipes and Saline Soothers. I will pass these out to family, friends and even strangers so people get to know the product. I have already hosted a Boogie Wipes/Saline Soothers get together with my Moms Group. Since I have been using Boogie Wipes for so long I assumed that everyone knew about this amazing product but I was so wrong. Through being a Saline Ambassador I have found out many people do not know about Booige Wipes but once they learn about them and try them they love them!